About 30 species of wide geographic distribution. Type species: Urtica dioica L.
Perennials, 2°-7° tall; flower-clusters large, compound. Leaves ovate, cordate at base, pubescent. Leaves lanceolate to ovate-lanceolate, rounded to cordate at base, nearly glabrous. Annuals, 6'-3° tall; flower-clusters small, mostly glomerate. Leaves oval to ovate, laciniate-dentate; plant leafy to the top. Leaves ovate or lanceolate, or the lower orbicular, crenate; upper leaves small. Perennial, densely beset with stinging hairs, stem rather stout, 2°-4° tall, puberulent above. 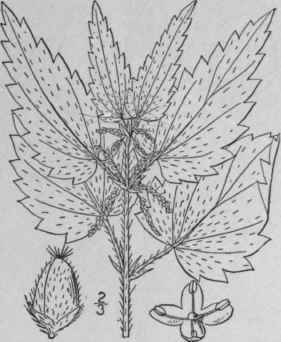 Leaves thin, ovate, long-petioled, acute or acuminate at the apex, cordate at the base, sharply or incisely serrate with triangular or lanceolate acute teeth, pubescent beneath, 3-5-nerved, 3-5' long, 1-3' wide; petioles slender, much shorter than the blades; stipules lanceolate; flower-clusters large, compound, cymose-paniculate; flowers dioecious or androgynous. In waste places, Newfoundland to Ontario, Minnesota, South Carolina, Missouri and Colorado. Naturalized from Europe. Native also of Asia. Plant lower, stouter and much more stinging than the following species. 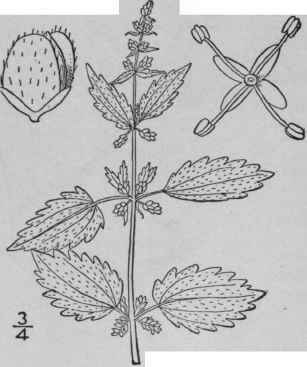 Urtica gracilis Ait. Hort. Kew. 3: 341. 1789. Perennial, sparingly armed with stinging hairs, stem usually slender, erect, simple or with few erect branches, 2°-7° tall. Leaves lanceolate or ovate-lanceolate, slender-petioled, long-acuminate at the apex, narrowed or sometimes rounded at the base (rarely subcordate), sharply serrate, 3-5-nerved, sparingly pubescent, 3'-6' long, 1/2'-1 1/2' wide; petioles shorter than the blades, usually bristly; stipules lanceolate; flower-clusters compound, smaller than those of the preceding species, but commonly longer than the petioles; flowers dioecious or androgynous. In dry soil, Newfoundland to British Columbia, south to North Carolina, Louisiana and Colorado. 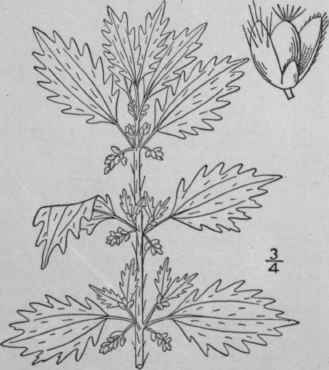 Races with ovate-lanceolate, coarsely serrate, cordate leaves have been referred to Urtica Lyallii S. Wats. June-Oct.
Urtica urens L. Sp. Pl. 984. 1753. Annual, stem rather stout, 6-18' high, ascending or erect, it and its slender branches stinging-bristly. Leaves thin, glabrous or very nearly so, elliptic, oval or ovate in outline, deeply incised or sometimes doubly serrate, with acute, ascending or spreading teeth, 3-5-nerved. 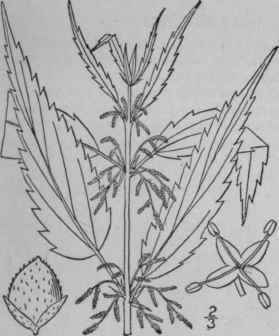 obtuse at both ends, or acutish, 1'-3 long, slender-petioled; petioles often as long as the blades; stipules short; flower-clusters oblong, rather dense, mostly shorter than the petioles; flowers androgynous. In waste places, Newfoundland to Manitoba, northern New York, New Jersey and Florida. Also on the Pacific Coast and in Bermuda. Naturalized from Europe. May-Sept. Burning or stinging nettle. Urtica chamaedryoides Pursh, Fl. Am. Sept. 113. 1814. Annual, sparingly stinging-bristly but otherwise nearly or quite glabrous, stem very slender, weak, ascending, simple or branched, 6'-3° long. Leaves slender-petioled, thin, crenate-dentate, the lower broadly ovate or orbicular, obtuse at the apex and usually cordate at the base, 1/2- 1 1/2 wide, the upper ovate or lanceolate, acute or acuminate at the apex, rounded or narrowed at the base, the uppermost very small; stipules lanceolate-subulate; flower-clusters small, glomerate, shorter than the petioles; flowers androgynous. In thickets, Kentucky to Arkansas, south to Georgia and Texas. April-Aug.